Histamine is a natural chemical produced by the body and is also present in many foods. Histamine is released by the body during times of stress, allergy, infectious diseases etc. Histamine (2-[4-imidazolyl]ethylamine) was discovered in 1910 by Dale and Laidlaw, and it was identified as a mediator of anaphylactic reactions in 1932. Histamine is a potent mediator of numerous biologic reactions inside our body. Who are the people who are hypersensitive to Histamine? Many people are hypersensitive to histamine, especially people suffering from allergies, asthma, urticaria, eczema, seborrheic dermatitis, ulcerative colitis, Crohn's disease, pompholyx, irritable bowel syndrome, and anyone suffering from an acute infection. Elevated histamine concentrations and diminished DAO activities have been shown for various inflammatory and neoplastic diseases such as Crohn disease, ulcerative colitis, allergic enteropathy, food allergy, migraines, headaches, and colon cancer. Histamine-intolerant women often suffer from headache related to their menstrual cycle and from dysmenorrhea. These symptoms may be explained by the interplay of histamine and hormones. Histamine has been shown to stimulate, in a dosedependent manner, the synthesis of estradiol. Healthy people have an enzyme, diamine oxidase (DAO), which breaks down any excess histamine that they absorb from a histamine-containing food or any histamine stored inside our own cells, liberated by histamine liberator foods. When healthy people eat a food which contains histamine, or foods that liberate histamines, it does not affect them thanks to a healthy level of diamine oxidase in their body. However, some people have a low level of this enzyme. When they eat too many histamine-rich foods they suffer ‘allergy-like’ symptoms such as headaches, rashes, itching, eczema, hives, diarrhea, vomiting, abdominal pain, flatulence, etc. This is called histamine intolerance. When you are hypersensitive to histamines, it is called histamine intolerance. Histamine intolerance results from a disequilibrium of accumulated histamine and the capacity for histamine degradation. 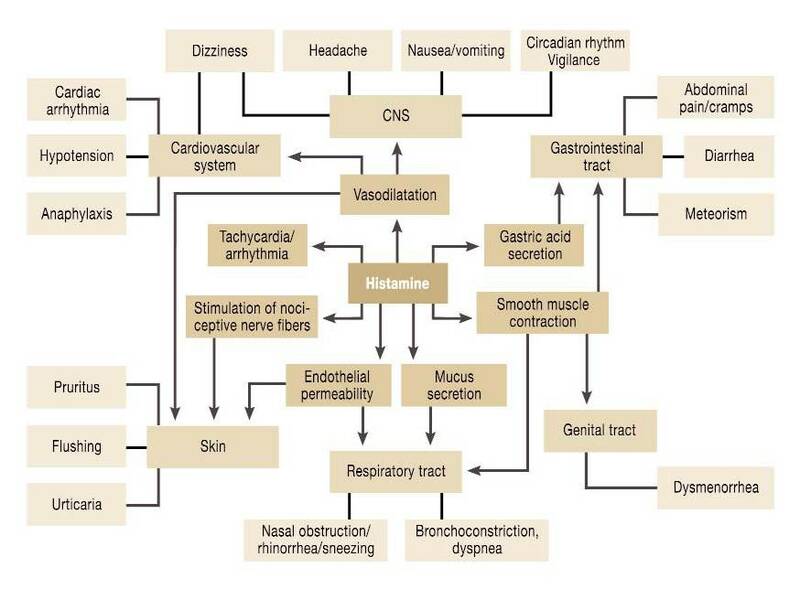 Next diagram shows all the symptoms associated with histamines, and the pathways how histamines affect different organs and different functions. Histamine-related symptoms. Maintz, L. et al. What dietarry factors have an important effect on the histamine levels in our body? There are 4 major dietary factors that can affect histamine levels inside our body. consumption of foods known as high histamine foods, like vinegar. consumption of foods known as histamine liberators, like sugar, MSG, sulfites, nitrites. consumption of diamine oxidase blockers (DAO blockers), mainly alcohol. consumption of diamine oxidase competitors (DAO competitors), mainly alcohol. What foods are known as High Histamine Foods? Tinned, canned and smoked fish (tuna, salmon, herring, mackerel) and crustaceans. Chocolate, cocoa, coca-cola, and all industrial drinks. Water is the only safe drink. What foods are known as Histamine Liberators? Foods that stimulate release of histamine from mast cells are called histamine liberators. Even foods low on histamines can be histamine liberators. Nightshades like tomatoes, paprika, peppers, potatoes, eggplant. Tree-nuts and peanuts, including walnuts, hazelnuts, pecans etc. Some food additives such as glutamates, benzoates, sulphites, nitrites, several colorants (yellow E-102 and E-110, E-124, amarant E-123), can release endogenous histamine. According to the Department of Dermatology at the University of Bonn (Germany), the intake of endogenous histamine-releasing foods or drugs causes the same symptoms as rich-histamine food intake. If you are suffering from any chronic health problem, odds are your diet is an important factor. Huge number of people suffering from different chronic health problems are actually intolerant or hypersensitive to some of the foods they may be consuming on the daily bases. Low histamine diet can help many people recover. Alcohol is one of the most harmful products for people with DAO deficiency. It contains histamine, cadaverine and other amines, it releases endogenous histamine and has the property of blocking DAO, with the possibility of interfering in the metabolism of its own histamine and of the one found in ingested food. Ethanol intake causes DAO activity reduction, even in healthy people without genetic DAO deficiency and not only in people predisposed to low DAO levels. Ethanol aggressively attacks DAO, so even with a normal level of DAO (activity higher than 80 HDU/ml) histamine saturation in blood occurs. This is perfectly reflected in the mechanism taking place in a hangover. Most people, even without having low DAO activity, present a typical picture of general discomfort that encompasses the set of symptoms, and these alcohol effects are due to the increased histamine in blood. What foods are known as low histamine foods? Histamine intolerant people thrive on food that has not been processed very much. Raw food, raw vegetable, raw fruit, raw organic milk, raw organic eggs, raw wild fish, raw soaked nurs, raw soaked seeds, raw vegetable juices, extra virgine oils, etc. Check the blood type lists and your own blood type, when choosing the food. Though beans and raw milk possess antihistamine properties, you can still be allergic to or react to them so please always proceed with caution! Beans contain lectins, surface proteins, and people of blood type O have particulary problem to tolerate beans. Soy is also a bean, and is also a top allergen. Milk is a top allergen! Headache can be induced dose-dependently by histamine in healthy persons as well as in patients with migraine (53, 61). Histamine-induced headache is a vascular headache caused mainly by nitrate monoxide (62). Histamine releases endothelial nitrate monoxide upon stimulation of H1R, which is also expressed in the large intracranial arteries (63). In migraine patients, plasma histamine concentrations have been shown to be elevated both during headache attacks and during symptom-free periods. An increase in the number of brain mast cells is associated with pathologic conditions such as migraine, cluster headache, and multiple sclerosis (64). Many migraine patients have histamine intolerance evidenced by reduced DAO activity, triggering of headache by food rich in histamine (eg, long-ripened cheese or wine), and the alleviation of headache (ie, disappearance of symptoms) under a histamine-free diet (57, 65) and therapy with antihistamines (66). Besides headache, gastrointestinal ailments including diffuse stomach ache, colic, flatulence, and diarrhea are leading symptoms of histamine intolerance. Elevated histamine concentrations and diminished DAO activities have been shown for various inflammatory and neoplastic diseases such as Crohn disease (17), ulcerative colitis (67), allergic enteropathy (39), food allergy (33, 68, 69), and colorectal neoplasmas (24). In the colonic mucosa of patients with food allergy, a concomitant reduced HNMT (70) and an impaired total histamine degradation capacity (THDC) (69) have been found (33), so that the enzymes cannot compensate each other. Therefore, an impaired histamine metabolism has been suggested to play a role in the pathogenesis of these diseases. During or immediately after the ingestion of histamine-rich food or alcohol, rhinorrea or nasal obstruction may occur in patients with histamine intolerance; in extreme cases, asthma attacks also may occur. Reduced HNMT activity has been shown for patients with food allergy (70) and asthma bronchiale (71). 1. Silla SantosMH. Biogenic amines: their importance in foods. Int J Food Microbiol 1996;29:213–31. 2. Bieganski T, Kusche J, Feussner KD, Hesterberg R, Richter H, Lorenz W. Human intestinal diamine oxidase: substrate specificity and comparative inhibitor study. Agents Actions 1980;10:108 –10. of intestinal diamine oxidase. Acta Physiol Pol 1983;34:139 –54. wine provocation test. Int Arch Allergy Immunol 1996;110:397– 400.
model. J Neural Transm Suppl 1990;32:291–314. adverse effects of sildenafil also caused by inhibition of diamine oxidase? Urol Int 2001;67:59 – 61.
with water insoluble agents applied by the intravenous route? Georg Thieme Verlag KG, 2004 (in German). with liquid histamine. Allergy Asthma Proc 2004;25:305–11. tolerance to infused histamine in normal, atopic and urticarial subjects. Agents Actions 1991;32:359 – 65. 20. Dale HD, Laidlaw PD. The physiological action of -iminazolylethylamine. J Physiol (Lond) 1910;41:318 – 44. Breathnach S, Cox N, Griffiths C, eds. Rook’s textbook of dermatology. Oxford, United Kingdom: Blackwell Science, 2004:9.50 –2. Munich, Germany: Urban & Vogel, 2004 (in German). colorectal proliferation? Ann N Y Acad Sci 1998;859:262– 6.
by guest on April 3, 2015 ajcn.nutrition.org Downloaded from growth on diamine oxidase activity in human gastrointestinal tract. 27. Schwelberger HG. Diamine oxidase (DAO) enzyme and gene. In: Falus A, ed. Histamine: biology and medical aspects. Budapest, Hungary: SpringMed Publishing, 2004:43–52. a histamine-methylating enzyme. J Biol Chem 1959;234:2948 –50. 31. Klocker J, Matzler SA, Huetz GN, Drasche A, Kolbitsch C, Schwelberger HG. Expression of histamine degrading enzymes in porcine tissues. Inflamm Res 2005;54(suppl):S54 –7. histamine degradation capacity in extremely small human colon samples. allergies. Inflamm Res 1999;48(suppl):S75– 6. 34. Backhaus B, Raithel M, Hahn EG. Nicht-immunologisch induzierte Histaminfreisetzung an vitalen menschlichen Darmschleimhautbiopsien durch Stimulation mit Polyaminen. (Nonimmunologically induced histamine release of biopsies of vital human intestinal mucosa after stimulation with polyamines.) Allergo J 2005;14:41 (abstr) (in German). 35. Tsujikawa T, Uda K, Ihara T, Andoh A, Fujiyama Y, Bamba T.
36. Schwelberger HG. Histamine N-methyltransferase (HNMT) enzyme and gene. In: Falus A, ed. Histamine: biology and medical aspects. Budapest, Hungary: SpringMed Publishing, 2004:53–9. metabolism in airway. Am J Physiol 1994;267:L342–9. 38. Raithel M. Durchfa¨lle und weicher Stuhl. In: Jarisch R, ed. HistaminIntoleranz. Histamin und Seekrankheit. (Histamine intolerance. Histamine and motion sickness.) Stuttgart, Germany: Georg Thieme Verlag KG, 2004:77–110 (in German). 39. Raithel M, Matek M, Baenkler HW, Jorde W, Hahn EG. Mucosal histamine content and histamine secretion in Crohn’s disease, ulcerative colitis and allergic enteropathy. Int Arch Allergy Immunol 1995; 108:127–33. 40. Sattler J, Hesterberg R, Lorenz W, Schmidt U, Crombach M, Stahlknecht CD. Inhibition of human and canine diamine oxidase by drugs used in an intensive care unit: relevance for clinical side effects? 41. Ahrens F, Gabel G, Garz B, Aschenbach JR. Release and permeation of histamine are affected by diamine oxidase in the pig large intestine. Inflamm Res 2002;51(suppl):S83– 4. 42. Aschenbach JR, Oswald R, Ga¨bel G. Gastrointestinal epithelia as barriers to luminal histamine of microbial origin. Z Gastroenterol 1998; 36:12–7. histaminosis under diamine oxidase (DAO) blockade in pigs: further evidence of the key role of elevated plasma histamine levels as demonstrated by successful prophylaxis with antihistamines. Agents Actions 1989;27:212– 4. 44. Petersen J, Raithel M, Schwelberger HG. Characterisation of functional polymorphisms of the human diamine oxidase gene. Inflamm Res 2005;54(suppl):S58 –9. 45. Petersen J, Drasche A, Raithel M, Schwelberger HG. Analysis of genetic polymorphisms of enzymes involved in histamine metabolism. Inflamm Res 2003;52(suppl):S69 –70. 46. Schwelberger HG, Drasche A, Petersen J, Raithel M. Genetic polymorphisms of histamine degrading enzymes: from small-scale screening to high-throughput routine testing. Inflamm Res 2003;52(suppl): S71–3.